They may be a relatively unknown quantity in most quarters, but in their native Scotland, Admiral Fallow have amassed a significant cult following. They are in fact regarded by many as key players in the nation's flourishing folk scene, and some have even raised the possibility that they could eventually break out and connect with an altogether wider audience. Debut album Boots Met My Face showcased a band comfortably excelling in both acoustic and electric styles, and although by no means perfect it was capable of hitting truly marvellous heights when it kicked into gear. Given the necessary attention, there can be little doubt that its impact would have transcended elsewhere, and that's something they've quite clearly aimed to achieve second time around. Early signs suggest that they may be successful, an outcome which would be just reward given how far Tree Bursts In Snow has broadened their scope. Commitment to diversity was one of their debut's defining strengths, but they've taken that notion to whole new levels here, with a varied set of amped-up folk anthems sitting alongside the gentler but no less ambitious remnants of their early days. It's a progression which tells of an appetite beyond satisfying their existing following, and for the most part the fruits of that strategy resonate strikingly well. 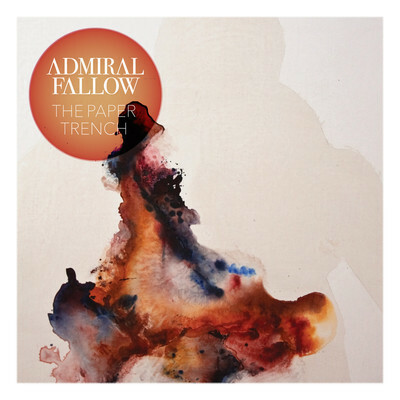 Albums of such an extroverted stance are often accused of lacking heart, but that's a criticism that could never be hurled at Admiral Fallow and their creative mastermind Louis Abbott. The Glaswegian has always taken an introspective approach to songwriting, drawing from his own experiences to fuel his emotionally charged compositions. His writing may have taken a notably more accessible swing, but that's still very much the case here. 'The Way You Were Raised' - an inspiring account of how alcoholism can adversely affect otherwise good-natured individuals - is the most obvious example, but there are plenty of other cases whereby his observations exist at the forefront. 'Brother,' for instance was written for his siblings during an especially troubling period of their own lives, while 'Burn' deals with themes of regret and Frightened Rabbit-esque single 'The Paper Trench' touches on Abbott's awareness of the current economic catastrophe. Elsewhere, 'The Way You Were Raised' is his blatant and completely unashamed attempt to pen a Bruce Springsteen song. Scots singing Americana? It's an evolutionary mismatch for sure, but one which nevertheless yields fabulous results. Curiously, it's when they stick to what they know that the record tends to be at its weakest and least interesting, but that is ultimately something which reflects well on the shifts that they've undergone. Tree Bursts In Snow is the sound of a band still very much in touch with their roots, but also striving towards goals beyond what they - and many bands of their ilk have achieved before. There are one or two stumbles, but by and large the risks they've taken have been well judged, and they could quite feasibly be sugarcoated by subsequent success. 6. Isn't This World Enough? ?